Tasty chicken for Sunday dinner. It was a great weekend. Our kids were around along with our granddaughter, so things were busy. There is never a dull moment when the granddaughter is at the house. She turned 2 this summer and is a little card and so much fun. I love having a full house and family around. It is one of my biggest joys. But by Sunday afternoon the kids had left and the house was quiet once again. I wanted something simple for supper. There were chicken drumsticks in the refrigerator that I had bought the previous day for just that reason. 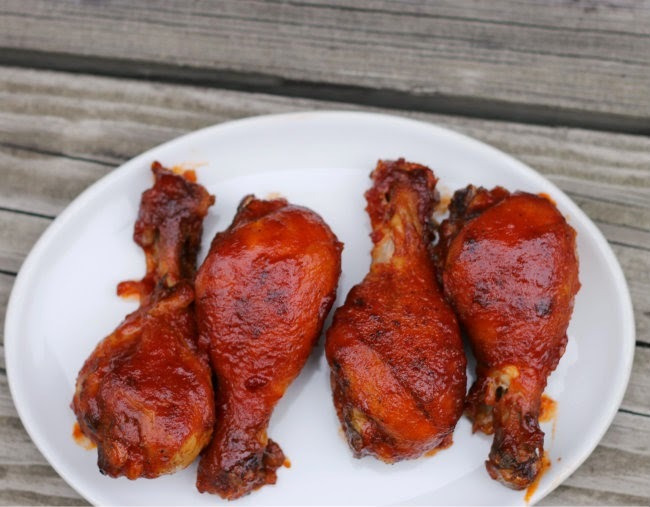 I have wanted to make chicken drumsticks that are fried until nice and brown and then baked with a tasty BBQ sauce. This is actually my second try at this recipe. The first time I made this I dredged my drumstick in flour and seasoning before frying. But after they were baked with the BBQ sauce the flour was kind of soggy and not too desirable. So this time around I decided to forgo the flour and just season the drumstick before searing them then baking them. This did the trick. The reason I decided to sear them first is I wanted to sear the outside and keep all the juices inside. 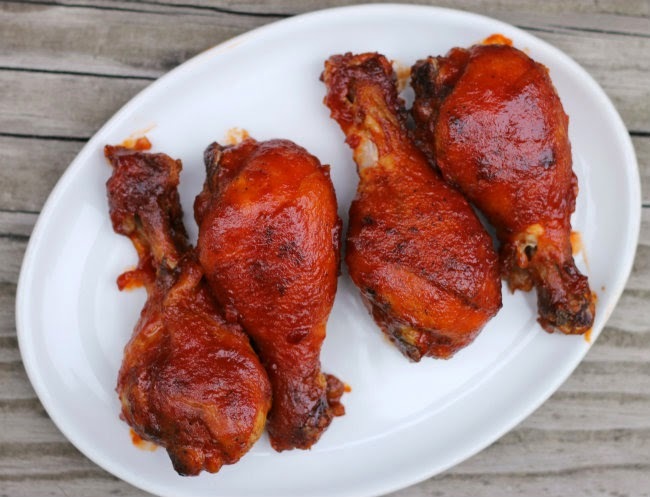 These chicken drumsticks were just that; nice and moist and full of flavor. 1. Heat vegetable oil in a skillet over medium heat, just enough to coat the bottom of the pan. 2. Mix the salt, paprika, and pepper together. Rub the seasoning over each chicken drumstick. 3. Place the chicken into the skillet cook until the chicken is browned evenly on all sides, for about 20 to 25 minutes. The chicken at this point is not cooked all the way through. 4. While you are searing the chicken make you BBQ sauce. Mix the ketchup, water, Worcestershire sauce, brown sugar, honey, vinegar, yellow mustard, garlic powder, onion powder, and chili powder into a small sauce pan. Over medium heat bring the sauce to a boil, stirring occasionally, reduce heat and simmer a couple of more minutes. 6. Spray a baking dish with non-stick cooking spray. Placed your seared chicken drumsticks in the baking dish. Spoon 1/2 of the BBQ sauce over the chicken. 7. Place the chicken into a preheated oven and bake for 20 minutes. 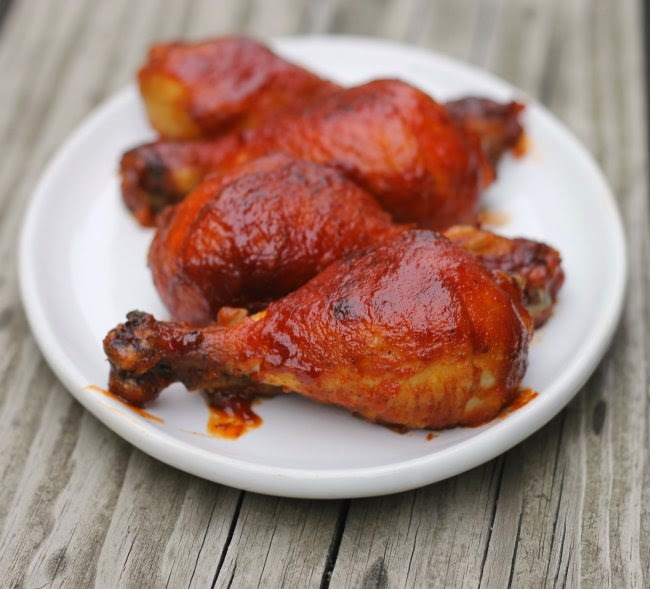 Remove chicken and turn over and spoon the rest of the BBQ sauce over the other side of the chicken. 8. Place the chicken back in the oven and continue to cook another 20 minutes or until the chicken is tender. 9. Remove from oven and let rest a few minutes and serve. Sounds like you got the recipe perfect this time around! I made the same mistake once when trying to make Hot Wings. I dredged in flour but the flour got mushy in the oven. When you have a good idea it’s always worth trying again. Your drumsticks look delicious. The hubby loves BBQ chicken! And homemade sauce always trumps bottled! Love the color of these! And I’ll bet the flavor is amazing. Really good recipe — thanks so much.